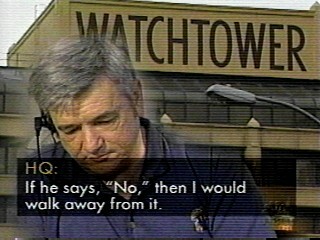 This episode of the news show Dateline was a blast to the Watchtower Organization that is still being felt. It was May 28th of the year 2002, and I was a young elder with a newborn baby and a devout Jehovah’s Witness wife. On top of owning and operating a business and having family responsibilities, my elder duties seemed endless. In the five years since being appointed an elder I had already seen two elders removed, which caused bitter in-fighting on the elder body because of it. Two “alpha-male” elders were constantly sparring and trying to out-quote the other using Watchtower articles during backroom elder meetings. These would sometimes last for four or five hours and were exhausting. I was serving as the Service Overseer and was a regular pioneer, although the pioneering had to give way soon as my body could not indefinitely take the pace of such a breakneck schedule. Another young elder (we had been appointed at the same time and he was only a year older than me) had confessed that he and his wife had committed fornication prior to being married and he had covered it up for years, but the elders used a loophole in the KS91 Flock book (the name of the secret elder handbook at the time) to justify his “repentance”1 which then allows the suppression of this revelation from the rest of the congregation. He was never reproved or deleted and continued to serve as the Congregation Secretary. Not long after his confession he moved his family to a neighboring Kingdom Hall, to “get a fresh start” as he said2. Since there was now only three elders left on the body at this point I took on the secretary position as well as the Theocratic Ministry School Overseer position. Shortly thereafter my wife complained that she “felt like a single mom” since I was hardly ever at my seat during meetings to help with the baby. 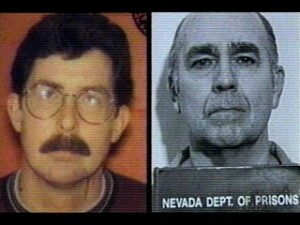 Two of the JW pedophiles that abused children as a Jehovah’s Witness and was highlighted in the Dateline episode. It was against this hectic backdrop that a mature and well-respected Ministerial servant said there was going to be an edition of the TV news show “Dateline” coming out that all in the congregation should watch. He said it was going to be a smear of lies against the Witnesses and that we needed to watch it so as to be prepared for the fallout. I had never heard of such a high-profile television show doing a piece on Jehovah’s Witnesses and I had absolutely no idea what it was about. I watched it, and it was far worse than anything that I had imagined it might be. 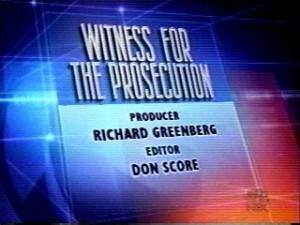 The title was, “Witness For The Prosecution” and it was a devastating presentation3. It outlined wide-spread child molestation among Jehovah’s Witnesses, and even had two insiders that were brave enough to come on camera and speak out against the damaging Watchtower policies that allowed these crimes to take place. Bill Bowen, former JW elder, stood up for the children that were abused due to WT policy. Bill Bowen went on to found the non-profit organization www.SilentLambs.org and has helped literally thousands that have been hurt by the Watchtower Organization’s harmful policies that allow pedophiles to run loose in JW congregations across the globe. A transcript of the entire Dateline show can also be found there as well. A PDF version can be downloaded here. Now as I reflect back on this pivotal moment it definitely made me pause and reflect upon my current religion. But I was asleep in the movement; a young elder filled with ideals and many ‘privileges’ in the congregation. I was well-respected and I knew that ones would be looking to me for my take on this damaging TV show. At the next meeting nearly everyone in the Hall was talking about it. The brother that had encouraged people to watch it had a VHS copy with him so that anyone that missed it could see it. We went in the back room as a body to talk about the situation, and decided it would be better if we de-emphasized the gravity of the Dateline episode, and discourage people from watching it since that woman from Bethel and that supposed elder were obviously ‘apostates’. Of course it blew over after awhile and the friends put it out of their minds. I put it out of my own mind! I had to, since I had so much to do family-wise, work-wise, and of course I had parts to prepare on the upcoming assembly and in the Kingdom Hall. I had committee meetings that lasted till midnight with wrongdoers to counsel and help at least once or twice a month and sometimes more. And that’s how the year 2002 passed for me. In a blur of JW-busy work. The knowledge that my religion might be mixed up in a vast cover-up of child molestation was simply too horrible to consider, so I submerged and exiled it to the deepest place in my mind. I hadn’t been worried about Y2K (remember that debacle?) and I wasn’t worried about global warming or President Clinton’s dalliances. I was a very good JW plow horse, and since the fields were “white for harvesting” I didn’t worry about much else. 1. The current handbook used by the elders is called “Shepherding The Flock of God” and has the same passage in it on page 38. 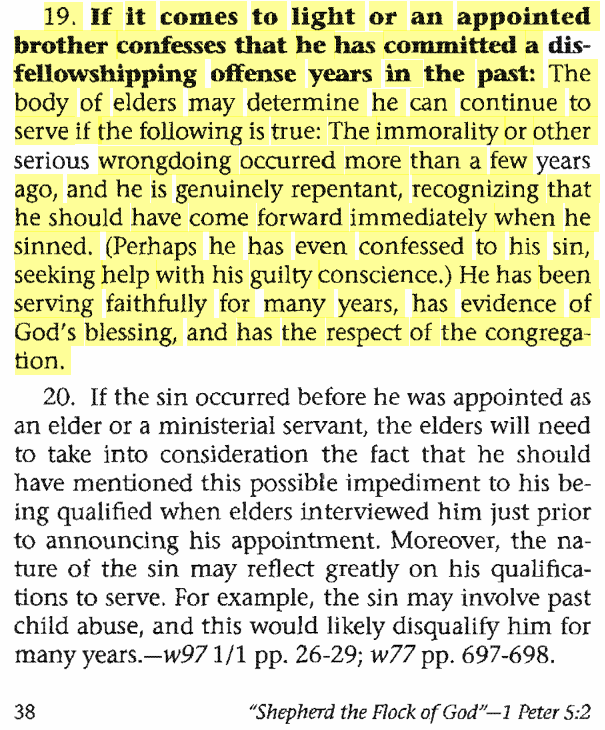 Click here to see a reproduction of this loophole used to allow an elder to commit fornication and receive no consequences and keep his position. 2. A year or so later that young elder left his wife and took up with a sister in the congregation they moved to and they were both promptly disfellowshipped. Those Dateline shows played a key role in me “waking me up.” When I saw that elders are instructed to report to Brooklyn first before the police at first I didn’t believe it. Then once I investigated it, the information was true. Another key part to me “waking up” was the movie “Witnesses of Jehovah.” I was literally appalled at the things I discovered. The investigation then snowballed. However, the biggest thing was the generation change. Not to get too technical but why does the beginning state that it was 2002 and the end 2000? Reading the loophole in the secret handbook reminds me how politicians create their ideal world around them too. Just as capitalists build the law around making huge personal fortunes while the rest of naive live in hovels is morally the same as protecting oneself from prosecution using one’s religious record to avoid the same punishment as the rank-and-file. The ‘charismatic’ elder in the Matthew Barrie judicial case had likewise nothing to worry about as soon as he had contacted his allies and neutralised the threat to his own religious reputation. The innocent but not-well-connected don’t get a look in. Hey, JJ. If you are going to write an article on next year’s 1914 centenary you may like to call it: 1914: Celebrating 100 Years of Urgency! I’ll get right on that article Frank- time is running out!! I don’t know if there’s someone else who knows about this things in my congregation. They’re all afraid to open web sites other than jw.org. They haven’t heard of Sparlock also. I will one day mention it to an elder. I’m just waiting for the right time. Thanks for the info..
Not that I’m suggesting we should go out and stab those profaning God, but severe punishment was demanded of those being perverse in God’s sight. No loopholes found in Numbers. The Dateline episode was certainly an event that caused more ripples in the JW world than any other event. Sadly, I missed it and when I heard about it, I thought it was all lies, misrepresentation, and half-truths. I remained asleep. It breaks my heart every time I read about child abuse and the way the Watchtower has shamelessly mishandled these crimes against the innocent. They have not shown any love or concern for the victims, just their own image, while hypocritically denouncing the Catholic Church and others! There is a pedofile by the name of Jaime Aransai in the West New York, New Jersey, area (originally of Puerto Rico) who has molested DOZENS of little boys and has not served a day in prison all in the name of “not bringing reproach on Jehovah’s name.” What about the kids? Governing Men should be ashamed of themselves! Yes, this reason/excuse of “not bringing reproach on Jehovah’s name”‘ for covering up wrong doing, presents a “false front”. At the 2013 DC we were told to avoid giving a false front…a false impression. Failing to declare openly the problem of sexual abuse in the organisation leaves children, and their parents, very vulnerable. I am so relieved that my children never fell victim to this sort of abuse…..I was so trusting of absolutely everyone in the “spiritual paradise”! It could easily have happened. Yeah. As elders we had no time to think. All the negative voices meant to us only apostate lies. There is so many of that accidents of child abuse among JWs. I wonder how Mr Brown, their spokesman could sleep at all… or GB? They know the cases are real – that’s the difference between many elders and them. They see it and partly approve it. It’s very sad and definitely SATANIC influence. Listening to Mr Brown with his smooth, gentle voice…one thinks of wolves in sheeps clothing…..counterfeit words to seduce the unwary! Yes, definitely satanic, and these men are blinded. On a slightly different personal note. Around 30 years ago I was involved in a car accident in which I was the driver and 2 people were hurt. I had been baptized for little under a year and while I was very concerned for those injured, I was also conscious of how the congregation would view me. So like all good little ‘sheep’ I went to see the P.O. at his home. The meeting lasted all of 10min in which time we didn’t even sit down or enjoy a cup of tea. His main concern and main question was “do they know you are a Jehovah’s Witness?” I said no, and that was the end of the meeting. Now admittedly he was a somewhat taciturn man, but I was quietly hurt by his lack of interest. The irony was that come the day of the court case no one from the congregation turned up to support me but my non-witness mother was there with my old priest – go figure! In my case I certainly was not the victim of what was a somewhat bizarre accident but the response of the elders & congregation was peculiar and I felt guilty for many many years. Years later the penny dropped and I realized that they were only concerned about how they looked. Hi Chri. What happened to you is what I too had suspected for many years as a JW; that we compartmenalise our ‘Christianity.’ The elder, taciturn or not, was probably too busy even to entertain you (as you point out). Far from being interested in your spiritual welfare, you were probably interrupting his day. Yes, we do have the right to expect more from members of the ‘true religion,’ especially God’s Pretorian Guard! Elders are required to to one thing, and rank and file are taught something different. According their own writings they should report that to be just and allow God’s anger to be poured on evildoers! Proper fear does, however, include due respect for secular authority, because the Christian knows that just punishment from the authority for a crime would be an indirect expression of God’s anger.—Rom 13:3-7. JJ, I have just read the extract from the Elders book and I am utterly gobsmacked by the double standard displayed. I shouldn’t be surprised but I still find their hypocrisy so brazenly self serving. No wonder they want the book to stay within a controlled group. If Joe Public were to confess to a historic sin would they take such a ‘merciful’ line? Another nail in their spiritual coffin as far as I am concerned. The problem is, I have used so many nails I can’t see the wood anymore!!! Good news for those who are stating Jehovah’s organisation is on the verge of collapsing. They forget Jehovah himself is blessing his people. Last service year we had a Peak Publishers: 7,965,954 = 2,4% increase over last year. Regular Pios:997,123 = 8,2% increase. Average of Bible Studies: 9,254,963! So when “Jehovah’s organization” had a huge dip in publishers after 1932 & 1975 was that a sign of His displeasure Sunset? I’ll give you another statistic to research. Do you know how many millions of dollars of publishers contributions have been paid out to the victims of child abuse, due to the WTS policy on covering over these sins? The New Age movement is gaining ground. Does that also have Jehovah’s blessing? It seems God’s blessing is everywhere! The Willy Wonka fan club membership is also up 3%!!! And we didn’t even have to go door to door! Frank, surprise, I am also shareholder of both companies and I am glad they are doing good. The extra-dividends I am using in our worldwide work. The new iPad Air 128 I am using in the fieldservice. So, yes it is a blessing we can use such electronic devices in Jehovah’s service. I just read on clicktop 10.com that The Watchtower and Awake are the number 1 and 2 on the Top 10 most popular magazines of 2013. Some who hope Jehovah’s organisation is on the verge of coillapsing must feel lonely now. But it is not to late to return. It may be true that WT and Awake are the most PRINTED magazines, but they surely also hold the title of the LEAST READ magazines as well. They are passed out in stacks all over the place, handed out as leaflets stuck in doors, left in laundromats, etc. and the JWs themselves don’t always read them either so it is a colossal waste of paper and ink really. I’m just getting rid of the old ones and gets not more than one of each for personal copy. I’m not placing magazines anymore other than the old ones. I’m using the bible only in going door to door. Hi Mav Erick. That was what led me to stop going out in service. At least with the JWs program. I wanted to make sure that I was giving a better accounting of the bible than I had received when I started studying, so I went through a ‘basic content’ preview with potential acolytes. It became more and more difficult to ignore that the doctrines of every church in Christendom were based out of the Bible and not just concocted as a deliberate plan to ‘mislead the nations’, as the WT would have us believe. When I shared such thought with others in the service group they went on and on about the importance of ‘accurate knowledge’, which kind of flies in the face of ‘new light. Once I started giving serious thought to scriptures that pointed out how sacrifices were meaningless to Jehovah when offered by wicked men, then ‘accurate knowledge’ became a secondary issue. So many in ‘the world’ are careful to live clean lives because of their love for God that I couldn’t accept that they would be condemned for celebrating birthdays or other such nonsense. Critical thought is not approved of by the WT any longer, so digging for treasure in The Word has to be done outside of the Org. C’est la vie. That’s nice, Sunset, so you need to tell everyone here that Jehovah is indeed blessing these commercial empires in order to further his work. You seem convinced that everyone here wants “Jehovah’s Organisation” to collapse. I’m not one of them, but I am reminded of the Berlin Wall when I hear you claim this. I think also that you should look at the BIBLICAL accounts of why the first two temples were destroyed by God himself even though it seemed to the temple-dwellers that such a thing could not happen. Take your pick from the many reasons revealed by knowledgeably people here who feel this may happen. Sunset said: The Watchtower and Awake are the number 1 and 2 on the Top 10 most popular magazines of 2013. I wonder if this could have anything to do with the fact they are free and are literally forced on people. I know one lady who took them to use as bin liners. They fit the bottom of her rubbish bin perfectly! I am not sure if this problem is still common among witnesses . The magazines stack up at home and don’t make it out the first door . It had seemed when I was a witness that perhaps half or more of them picked up at the kingdom hall didn’t get distributed . We still have magazines at the local Laundromat . When I used to use the Laundromat I never saw anyone else taking a peek at them but the owner would regularly gather them for the trash can . Occasionally I’ll see them “placed” at other places ; some seeming rather peculiar . Frank has a real and valid point about “whose statistics” . . .
Over time I have read or heard this same claim applied to various publications in the world . Could this be another “who has the truth” ? When I was still an active JW even I didn’t read the Awake or any of the extra articles in the WT. The material was too dry and lacked legitimate advice on how to cope with real Christian problems. I won’t say the magazines were entirely without merit, but counting them in the top two of dispersed publications in the world is just a silly numbers game. A survey of people who are too polite to refuse the magazines would reveal that even fewer of them per capita than active JWs actually read them. The ‘preaching work’ could be more accurately compared to littering than service. Before I stopped putting in field time I had set the magazines aside and was only offering bible studies at each door. The response was more favorable, but it required actual ‘work’ to keep it up. Before starting on the ‘Knowledge Book’ I had to give the pending student a background in bible history and structure that I had prepared myself. Sunset, that’s the only real way to do the business. Preparing that background, though, made me question what the recommended study aids were offering by comparison, so I couldn’t keep shoveling out the ‘Bible Teach’ book or similar materials that were more concerned with doctrine than truth. Sunset, I still believe it is possible to serve the true God, Jehovah, within the Organization of JWs, but once you truly start doing real work to ensure your students will be fully prepared to examine the scriptures, you might not want to. I wish you the best on your campaign. Miscreant droid, last year we had not only a 2,4% increase in publishers but we had also more than 9 million bible studies. It shows we don’t distribute magazines only in our preachingwork. I usually offer a bible study on the first call. The magazines I offer only if the person shows real interest in ou work. But I am glad The Watchtower and Awake are the number 1 and 2 in the top 10 most popular magazines of 2013. I am sorry you are not anymore an active JW. But you can be built up and strengthened spiritually by considering articles in these two magazines. I personally helped already several Jehovah’s dear sheeplike ones who have strayed, to return to the flock. By showing love, compassion, kindness, mildness and patience, lost, but in Jehovah’s eyes still precious sheep can be helped to enjoy serenity and real happiness in Jehovah’s flock again. That is the reason I am here. Hi Sunset, thanks for replying. I’m not suffering spiritually. The study aids from the WT were sometimes enlightening, but only when I was new. After several years there was nothing in the magazines that didn’t seem like a constant retread of previous articles. I understand the importance of ‘inculcating’ the law, don’t get me wrong, but there was just nothing from the book counter that could possibly inspire me anymore. I’d gone through the I.S. and other ‘deeper’ study aids of the WT, but the tone was so bland and one-sided that I didn’t feel I was growing spiritually. I still go to meetings with better regularity than most, so I know that nothing has changed. I had to look outside of the Org.’s publications to re-find my love for Jehovah. I’m not a lost sheep. I’ve just learned to put the voice of the true Shepherd ahead of the voice of the inexperienced farmhand. I’d like to recommend Philip Yancy’s “Disappointment with God” to you as an example of writing where serious love for Jehovah comes through. The WT and Awake have never had such sincere love for Him made so clear. I wouldn’t have survived being a Christian without Yancy’s work. When you learn how strong the love for God can be from those outside of the Organization, you’ll learn the real meaning of the description ‘worldly’, and how the WT has perverted the meaning to separate you from your real brothers. If there are others like you and me who logs on to sites other than jw.org, maybe this years figures and the following years will show a different result. If there are others like you and me who logs on to sites other than jw.org, maybe next years result or maybe the following years will be different. Sunset, remember too that the Watchtower and Awake! magazines are distributed free of charge. How does this stack up against other magazines like Time, National Geographic etc? You seem to be completely ignoring that fact that religious magazines placed in the street work will likely end up in the trash cans even before they’re read, or do you think polite but non-religious people who smilingly take a gift to avoid a confrontation or being witnessed to and have no interest will be prepared to read the articles in the busy life they lead? Of course, the argument is the same as your shares in commercial companies. Do you then say that God is using McDonalds and Apple to accomplish his will based on the fact and similar that dividends mean that you can purchased an Apple product to download WTBTS literature? So far you have been silent on this. As to the contents, the only article I read recently was one on whether all languages came from one geographical location. As usual the article was full of out-of-context quotes, simplistic reasoning, and pseudo-profundity. Hardly literature with an intellectual flavour. Hi Sunset . Good to see you back here again in this part of Jehovah’s flock . There truly are up building & faith-strengthening articles in the WT & G .
And I relate to what you say . I would look for Bible conversations in the territory on Saturdays during “magazine day” . Sometimes a brother with me at the door would feel uncomfortable if we were invited in for a good Scriptural discussion . But I would always talk Bible , even if it was magazine day . But what we all here need from you is this : Give us the Word of God ; we have already carefully scrutinized and appreciated enough of that so-called “meat in due season” . Scriptural clarity has Strength and Harmony . Also , we have learned not to put our trust in mere mortal man , have you too ? But our Shepherd guides us along in a better way than human organizational direction . And there is much “Worldliness” in that organization . They think it’s the closest thing to God’s Kingdom on Earth . They stand tall in the wheat field : looking better than the best wheat in the entire field . Be discreet & careful for weeds . There is not a great abundance of this spirit in the WTO . But don’t get too frustrated and lose heart while living with that organization . Brothers and sisters in Christ are from all peoples . Not just the ORG . I did not enjoy serenity and real happiness in the WT flock. I was content for the first two or three years, then when the pressures of motherhood came upon me and I couldn’t keep up my auxillary pioneering, I only ever felt “not up to par”. I think for many the predominant feeling is one of guilt. In recent years I had become increasingly disturbed by the hypocrisy in the organisation, and the lack of real love between fellow believers. Maybe Sunset you are one of those rare individuals who really does care. Please don’t neglect your brothers and sisters in the KH to come here. Maybe you can be a force for good in the KH. It sounds like you haven’t had the negative experiences that many of us have had, and that’s good, for you. I wish it was that way for everyone. My reason for leaving was primarily doctrinal. I simply do not believe that Jehovah has appointed the WTBTS as His only channel. The evidence and the claims do not stack up if you really honestly and objectively analyse them. Having come from a Catholic background, I felt that the GB was assuming pope-like status and usurping the role of Christ. I believe they have become the object of “creature worship”…much like Russell had in the old days. Getting back to the preaching work. How successful have you been in making disciples, which is the whole purpose of the preaching? (Disciples are baptised JWs) The disciple making carried out today is nothing at all like in the first century. The message is nothing like that of the first century. If peoples lives are at stake, why give out magazines about snail slime, how to make enchilladas, the rare orchid lilly…and such things? It’s all very interesting but it’s not life-saving information. If people really need to be one of JWs or they are dead at Armageddon, don’t they need to know that up-front? URGENTLY!! How many people are on the globe? How many JWs are there? How much time is left? My last Bible student was beating herself up about not being able to quit smoking. She loved Jehovah’s promise of the resurrection. Her eyes lit up talking about it. She longed to see her mother and daughter who had both committed suicide within weeks of each other. She knew she wouldn’t survive Armageddon if she smoked. Guess what? She took her own life. That’s a sad story. JW judgmentalism/Pharisaism at it’s finest! Its so great to see all the love going on here right now. Goodness bro DanialB, l loved what you wrote because that is exactly what l was trying to say, but could not find the words. Thanks Ruth . That was a quote from what bro MD said though . Knowing the voice of the true Shepherd certainly helps us . The mild-tempered , lowly at heart & refreshing Shepherd ! The voice of the true Shepherd says: “Trust in Jehovah with all your heart and do not rely on your own understanding. In all your ways take notice of him. And he will make your paths straight. Do not become wise in your own eyes. Fear Jehovah and turn away from bad”. Proverbs 3:5-7. Absolutely brothers and sisters…Listen to the voice of the shepherd! “My sheep listen to MY voice, and I know them, and they will follow ME” – Jesus’ words at John 10:27 I “heard” the call of the shepherd over the last few years but because of indoctrination (and fear) I did not follow. But my inner voice, my conscience, was growing louder and louder, until I couldn’t ignore it any longer. I made the decision to cut off what was stumbling me, the GB, which was painfully difficult, but it had to be done. When I did that I felt a tremendous sense of approval from my heavenly Father, and from Christ Jesus. I truly felt “found”…..never a sense of being lost. I still feel that way. I have described my experience as being born….as coming out from the womb. I was trapped in a dark place, I couldn’t move, or see or hear clearly. I was connected to the placenta, my life-giver. But placentas don’t last forever, and they become unhealthy. If I didn’t cut the cord I would die. So I took the plunge and cut it. Then I was born! I was delivered straight into the arms of my true life-giver and Saviour, Jesus, who has held onto me ever since. Sorry if this analogy has made anyone queasy!!! Since then I have gained much more scriptural understanding with the help of my friends here. My faith has been tested too, I have more spiritual focus. Prov 3:5-7 is one of my favourites. It keeps us humble. It says do not rely on your own understanding, nor should we rely on the understanding of any man, or group of men (in whom no salvation belongs). We certainly would not force anyone to comply with our own understanding, as the GB does. No-one at this site does that. True Christians do not seek to cause divisions, as the GB does, but are united in love. I’m still in the organization, but am thinking of leaving. It’s just that I’m waiting for the right time, I don’t know. Maybe what I’m waiting for is to be kicked out. My wife is with me in this. My son is disappointed in what we are discovering and is seldom joining in the field service, but I think he still values his friends, cousins and other relatives. Most of the elders did not like the bible highlights that I delivered last meeting (Letters of Paul to Titus and Felimon). I highlighted the part where Onesimus in order for him to be forgiven corrected his mistakes and in going back to his master shows he was not afraid to be punished. Something that they do not like to hear or expected to hear. What they want to hear is just to forgive because that is what a good christian should be, without any effort on the part of the transgressor to correct mistakes or seek forgiveness. Maybe one day they’ll kick me out. But as JJ said I must let my light shine while I’m still in there. Some bros and sisters smiled approvingly of what I highlighted. Some congratulated me.. Enjoy it while it last..
Wow…that’s excellent Mav Erick!! Who knows what good you can achieve…Reminds me of the verses, “Send out your bread upon the surface of the waters……sow your seed and until evening do not let your hand rest; for you are not knowing where this will have success, either here or there…” (Ecl 11:1,6) Whats that other expression…”Make hay while the sun shines”? Make lots of hay brother!! How did we allow ourselves to remain in darkness so long? In my Hall we had two really long-time elders (one former CO and the other was a former Bethelite and Bethel JW Apologist) who would fight over the most petty things. For a year, they got in about what was the correct way to announce the “Meeting for the Field Ministry Education” and they began to hate each other over what the correct way to say “Theocratic Ministry School” using old Watchtowers to back up their weird ideas. My study of the Bible has increased since stepping away from the Hall now, lucky me, I have not received any Shepherding Calls so I was hoping you could do a shepherding call on me and my family. The elders stopped checking on me a few years ago so am I now officially faded? Well written articles Eric, your fellow ex-Watchtower friends love you. I’m glad you have gained independence from the WT brother! You ask a great question Carlitos about have you officially faded, as there is no set time that would completely cover every answer to this. We do know that the secret elder’s handbook entitled, “Shepherd the Flock of God” (KS10 is the abbreviation the WT uses and many elders refer to it by this designation for utility but also to obfuscate their conversations) has a comment that pertains to this. It says on page 73 that depending on how long a person has been away the elders may choose to just “leave it in abeyance” and not bother the person until they attempt to come back. So yes, in my mind anything over three years or so means you are under their radar and they will likely leave you alone. Well, we’re using the Bible as our guide. If someone finds disagreements between their religious organization and the Bible I would think a true sheep would put Jehovah’s Word first. Those verses from Proverbs were aimed at those who took little interest in the Law’s counsel, not those who carefully search it each day, like most of us here. Unless, of course, you have decided that only the Anointed are capable of interpreting the NT and therefore are the only ones to take counsel from. Since that advice comes from the WT instead of the Bible, I find it difficult to understand why JWs claim their teaching is solely Bible-based. Surely, Sunset, you’ve had moments during your Bible-reading where you’ve found a minor discrepancy betwixt the Word and the WT, and moved on (as a good Christian should) without wondering why the Org. interprets the matter differently than you would have? I used to do that too, so I can’t fault you too much for it. Once I discovered (how did JJ put it?) that the WT gives us prescription glasses to view the Word with, then a whole new world of Truth opened up to me. Don’t discredit your own thinking abilities, Sunset. Proverbs warns us also that the fool believes everything he is told, and Acts shows us that the Boreans gave careful consideration to what was being taught by Paul and they were referred to as ‘noble-minded’ because of it. So we are actually required to be cautious, skeptical, and even critical within reason. I’ll grant that there’s a great deal of bitterness here at the Struggle, from those who have been bullied and mistreated by Elders ‘lording it over us’, and certainly many comments here are deeply flavored with that resentment sometimes. But most of us are still living clean moral lives as described in scripture, so it’s not particularly charitable of you to suggest that we don’t recognize the Shepherd’s Voice. We’ve just opened our ears a little wider to make a better distinction. Don’t take my comments too seriously, dear Sunset. I’m glad to be chatting with you. We have the impression that you are disobeying your “Faithful and Discreet Governing Body” by being here Sunset. Isn’t it hypocritical to condemn folks for their comments while you do the same? I had my first Bible Study with my wife last night, she almost vomited after reading the “1934 Year Book of Jehovah’s Witnesses” and she began to cry for hours. May I share what she said, I doubt she is going to be checking out this website any time soon so here you go “How could this be the Truth if Brother Rutherford was attacking the American and UK Governments while he praised Aldoph Hitler’s Germany for standing up against the wicked and greedy Jews”. She said “WTF? When I showed her Russell’s words that “new light” can’t take away anything from truth” and “any in the present truth” she said “Present truth, I thought truth was truth, if a math truth is flexible it’s not a truth. In physics and biology, truths can’t be a truth if they are bound to change, that’s why the word “hypothesis” is used if something is going to change. She said “my whole life has been following men who are saying that Jesus is bound to reward them because they were the least screwed up in Christendom. The United Nations scandal hurt too, we wanted to join the YMCA for our kids with gymnastics and use their gym but we were told “If you involved yourself in the YMCA your kids and your family has joined Christendom and you dirty yourself.” We just wanted to use their gym and physical fitness resources, not join a Christian group. Bluntly we are told, “No if you join you could be kicked out for touching the unclean thing!’ If the Watchtower joined the United Nations for any purposes, how can they look anyone straight in the face after telling me for 30 years I can’t join the YMCA even to use their physical fitness library? They are a Cult no! It’s taken almost three years to finally get her to see the lies and their recent evil acts of revising the “Truth Book” and other books that reveal they lied caught her by a storm! God Bless you Eric, it’s working now! Hi Sunset. Please remember that all sorts of hurting and confused people visit this site. Many leave the WT feeling disillusioned and let down. Many are angry. They don’t know who to trust. Whose understanding do YOU trust? Is it not the understanding of another person/s? You allow a group of imperfect men (by their own admission) dictate to you what is right and wrong…You even allow them to dictate your thoughts. The course of wisdom is to not just go along with what men say but be like the Boreans. (Acts 17:11) “Test out” the “inspired expressions”(1 John 4:1). The Awake June 22 2000 says, “What is the track record of those speaking?” Well, the track record of the WTBTS is pretty abysmal, in many areas. How many sheep have they lost or murdered? I don’t think the true Shepherd would be very pleased. For decades the WTBTS has been learning the fine art of digging themselves out of deep philosophical holes and, with the Internet, this is becoming more strenuous. 1 Join the UN as an NGO and claim they only wanted to use the library when discovered. As you point out, even “joining” the YMCA will attract a charge of apostasy. Not, surprisingly, even today, the WTBTS screams ‘human rights’ using the UN charter to ensure their religious rights are respected, while simultaneously denying the same stated rights to its own followers. Also, they regularly use the services of the OSCE, a UN affiliated political organisation, for help to have the Good News preached. Apparently God’s power is not enough. 2 They regularly “update” the Organisation’s history, deleting contentious expressions, incorrect predictions, and even spinning or removing embarrassing parts of their past, such as CT Russell’s preoccupation with the occult and his ‘jellyfish’ encounters. Actually, Russell got 1878 AD Biblically-correct, pity about the rest. To claim this today, though, would mean the founder would be shunned as an apostate. Roll on 2014. Any one care to make a prediction? ” Today there is a 50/50 chance of what you see is what you get ” . As for tomorrow , we will see and learn from tomorrow when we get there . However , my prediction won’t end in utter failure . They will get the bug to make some erroneous “prediction” again , no doubt , that will end in utter failure again . It’s always best to wait on the words of our Father and His Son for such things . There is no use in them trying to take the place of the word of God . . .
Great observation DanielB- perhaps you can start buying stock for me! The story of Martin Luther, famous theological reformer and perhaps the first so-called apostate of the Catholic Church is fascinating.